There is a little-known campsite at Mission Peak, but it is one of my favorites. The views are wonderful and it is a perfect base camp for catching a sunset from the peak, or a sunrise, if that is your persuasion. My wife and I restarted our backpacking with an overnight to this spot, accompanied by another couple. This was my first non-Scout backpacking in years, and it was lovely. 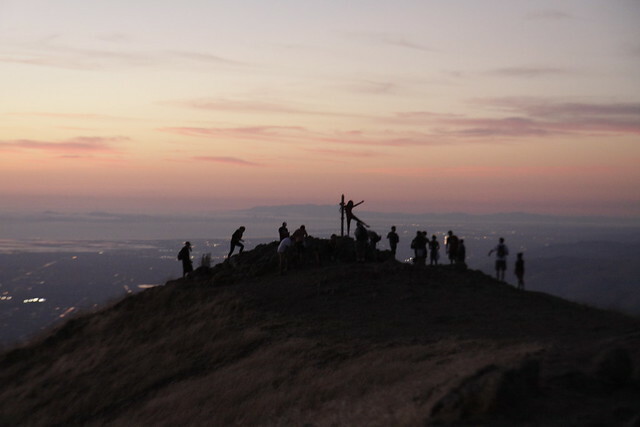 Mission Peak is a very popular hike—we were amazed at the number of people up there at sunset. The rest of them had to hike all the way out in the dark. We strolled back to our campsite. This photo is only a sample, we counted over fifty people. It was a party. Eagle Spring Backpack Camp is just north of Mission Peak at about 2100 feet (roughly 400 below the summit). Make a reservation through the East Bay Regional Parks District. The park website has a nice PDF map, though you’ll probably also need a Sunol Regional Park map (if you take my advice). 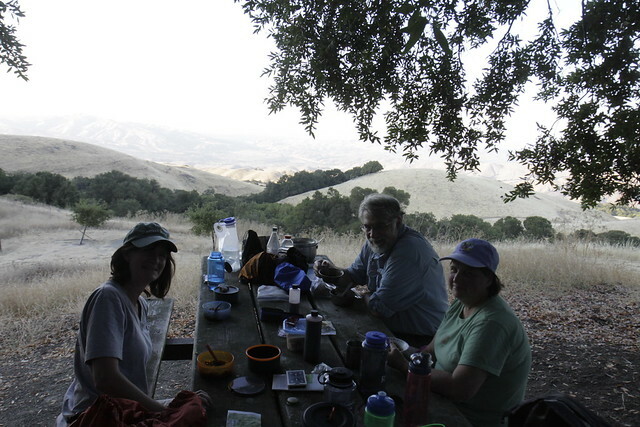 I like hiking Mission Peak from the Sunol Regional Park trailhead, especially for an overnight. Most people take the 3+ mile trail from the Fremont side, but that is steep for backpacking and the parking is problematic. 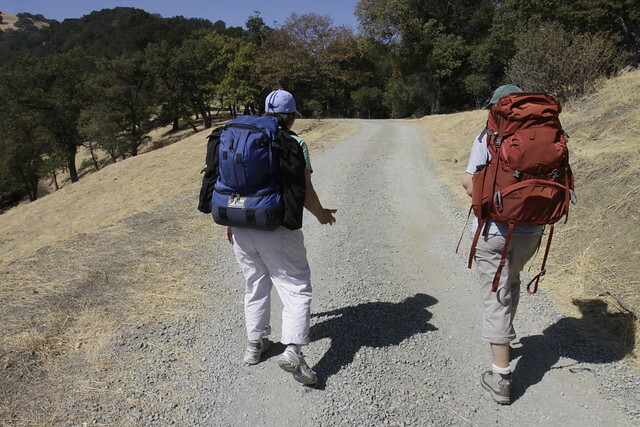 Starting from Sunol adds an entrance fee and a $2/person Ohlone Wilderness access fee, but the trail is a nice, steady spread climb over five miles and the park closes at night, so your car is relatively safe. Most of the trail is a fire road, perfect for groups who like to chat on the trail. Vintage gear connoisseurs might want to check out Tina’s Lowe Alpine Systems pack. All of the campsites have clear views north to Mount Diablo. Three are out in the open, and one is up a rise and sheltered under a spreading California bay laurel. Tina likes trees, so we camped there. Climb the peak from the south side. The north approach is a too-steep, rutted mess. The southern trail to the peak is a regular trail in fine condition. Even on a day hike from the north side, it is worth going around. And if you are still not sure about the view from this camp, here is a something from an earlier trip. Think about all those people heading home on the I-680 freeway while you are relaxing with a priceless view of Diablo. This is one of my favorite computer backgrounds. Feel free to use it. FInally, here is a Flickr set from the trip. It is short, less than twenty pictures. I’m a tough photo editor. 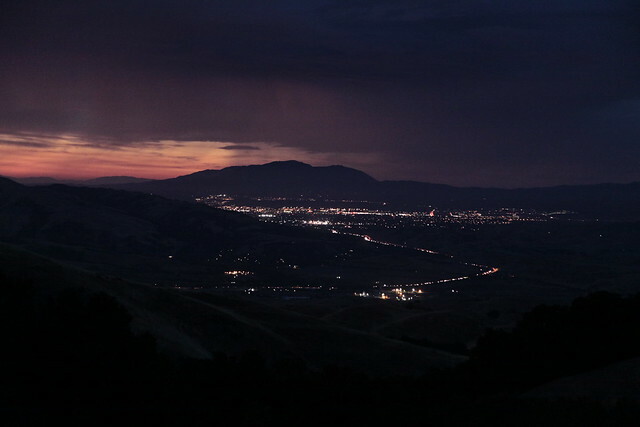 This entry was posted in Backpacking & Hiking, Photography and tagged Eagle Spring Backpack Camp, Mission Peak. Bookmark the permalink.